One of the Nolimit City slots, Kitchen Drama: Sushi Mania is part of a series that is offered by this developer, which obviously has a focus on Japanese cuisine in this case. Nolimit City’s Kitchen Drama is a series that has the Sushi Mania game in it, along with another one that’s dedicated to BBQ foods. For Sushi Mania, it’s obvious enough what kind of ingredients you can expect to find on those reels. Speaking of reels, the symbols of the game are placed on a kitchen counter, one made out of wood by the looks of it. The 15 symbols/ingredients range from pieces of fish to rice, vegetables and various spices and recipients that host things like salt, pepper or soy sauce. You have a couple of meters on the game’s two sides. I enjoyed the game’s design, I think that it was fairly well handled, particularly since it’s expected to have a Japanese style look. The ingredients were all turned into characters, sporting eyes and a mouth, looking cute. Like in a lot of other games, here you can use 5 reels and you will activate 20 lines on them each round. You get your wild symbols, two types, along with Wild Sushi Free Spins and a Kamisabi Second Chance. A good payout in this game could mean as much as $2,500 from just one combo. Limited budgets are accommodated by the game, with the smallest amount that can be used per spin being $0.20. As for the highest one possible, that one reaches $100, where the lines get $5 each. Forming combinations results in the removal of winning symbols, new ones being allowed to come in and create other wins for you. Two types of wild symbols are visible on the reels, both being used to replace all other types of icons available. The Bunshin wilds are among them, looking like blue blobs with ninja masks. These wilds clone themselves to up to two extra positions. They appear on the middle three reels. If during a single spin of Sushi Mania you get wins from Soy, Rice and Salmon symbols, then you trigger the free spins. There are 10 spins triggered, with sushi ingredients transformed into Sushi Wilds. There is also something called a Kamisabi Second Chance, activated after at least three consecutive wins. Additional collapses are triggered, with a bigger chance of getting more wins. Kitchen Drama: Sushi Mania is a cute game, with complex features that feel interesting even after more than a couple of spins. 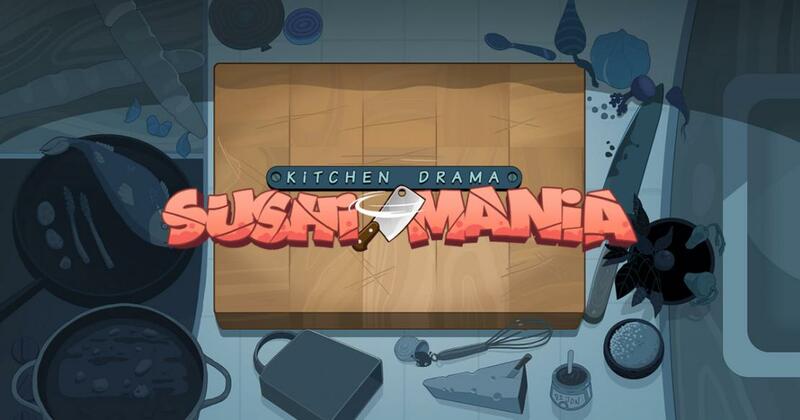 Try of out a demo version of Kitchen Drama: Sushi Mania.